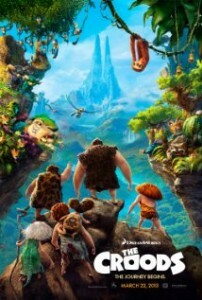 Summary: The Croods is a prehistoric comedy adventure that follows the world’s first family as they embark on a journey of a lifetime when the cave that has always shielded them from danger is destroyed. Traveling across a spectacular landscape, the Croods discover an incredible new world filled with fantastic creatures — and their outlook is changed forever. Dave Griffiths’s ‘The Croods’ Review: Please check Dave’s review of ‘The Croods’ that is available on the Helium Entertainment Channel. Other Subculture Media Reviews of ‘The Crodds′: Check Episode #26 of our The Good The Bad The Ugly Podcast for a more in-depth review of ‘The Croods’. Subculture Media ‘The Croods’ Interviews: Interviews with various cast members of ‘The Croods’ can be found here.